Combined injuries to the anterior cruciate ligament (ACL) and lateral knee ligaments are an increasingly well-documented injury pattern. ACL reconstruction is one of the most commonly performed procedures in orthopedic surgery, but the reconstruction is at risk of failure if existing concomitant pathology, such as a lateral ligament injury, is not addressed. Studies have suggested that lateral or posterolateral knee instability occurs concomitantly with ACL injuries in 11–19.7% of patients. This combined injury pattern is important for orthopedic surgeons to recognize and treat appropriately in order to optimize patient outcomes. 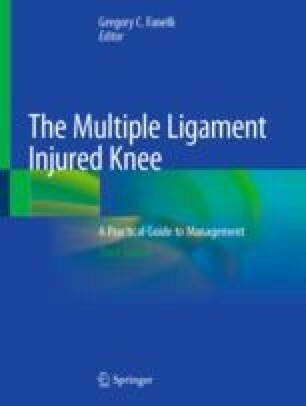 The purpose of this chapter is to discuss the current state of combined anterior and lateral knee instability. It will begin with a brief overview of the pertinent anatomy, pathophysiology, and biomechanics of the ACL and lateral knee ligaments. Then, a discussion of clinical evaluation including history, physical examination, imaging studies, and diagnostic arthroscopy findings will assist the clinician in the appropriate evaluation of these injuries. Finally, the treatment options for combined ACL and lateral knee injuries in both the acute and chronic setting will be reviewed.